Blessing: In myth Hera often gets the short end of the stick, coming off as a jealous shrew and a cruel persecutor of the unfortunates who attract the wandering eye of her husband. But Hera also has a protective and nurturing side. She is faithful and dutiful. She is the guardian of marriage, wives, mothers, and women in general. Like Athena, she is also a Goddess of civilization, ensuring that oaths are kept, that the interests of wives are protected (especially important in a male-dominated society), and that property is passed down safely to the next generation. She also has older, often ignored, connections with nature, particularly cows, peacocks, cuckoo birds, The Milky Way, and spring rain. Ways to honor: Respect marital vows, your own and those of others. Work hard at your relationships. Keep the romance alive. Don’t fall into a routine, or take your partner for granted. Be aware of your jealousy, and the effects it has on how you deal with your partner. Try not to do things that will make your partner jealous. Surprise your partner with little things that you know will make them happy. Keep the lines of communication open. 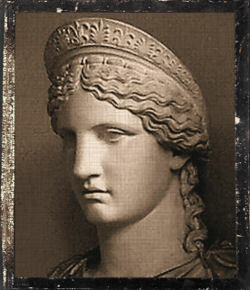 A good marriage isn’t an easy thing to create, but all the effort that goes into it is a way to worship Hera. Don’t forget to pray to her when you’re feeling stressed, frustrated, or taken advantage of. She often has really good advice!